We all like to enjoy ice cream in our household; however, I would probably call my hubby more of a “connoisseur” of it. You see, I’m pretty much a creature of habit when I enjoy this delicious treat of the cold and creamy kind, as I’m a “Rocky Road” or “coffee-flavored, slow-churned-lower-fat-variety” kind of gal, not really deviating much from that flavor profile or style when I’m shopping for ice cream for myself. My husband on the other hand, loves to try out various flavors and textures. He’s zany like that. He’s now officially left the “slow-churned” camp (too soft and “airy” for his taste), and has ventured back out once again into the good ol’ full-fat ice cream and gelatos (“If I’m gonna eat ice cream, I want the real stuff” he says) enjoying anything from cookie dough, to peanut butter-chocolate-fudge, to mint chocolate chip, to cookies and cream, to that crazy flavor concoction called “Chubby Hubby” that’s a “vanilla malt ice cream with peanutty fudge-covered pretzels with fudge & peanut buttery swirls”—that’s a glorious mouthful just to describe, let alone eat! Inspiration for recipes often comes to me in the form of concepts or names for potential recipes, or in already existing products that I feel would be fun to play around with and change a little; and “Chubby Hubby” ice cream was definitely the perfect pick to get inspired by for a new cookie recipe, if you ask me. Plus, I think the name is hilarious! 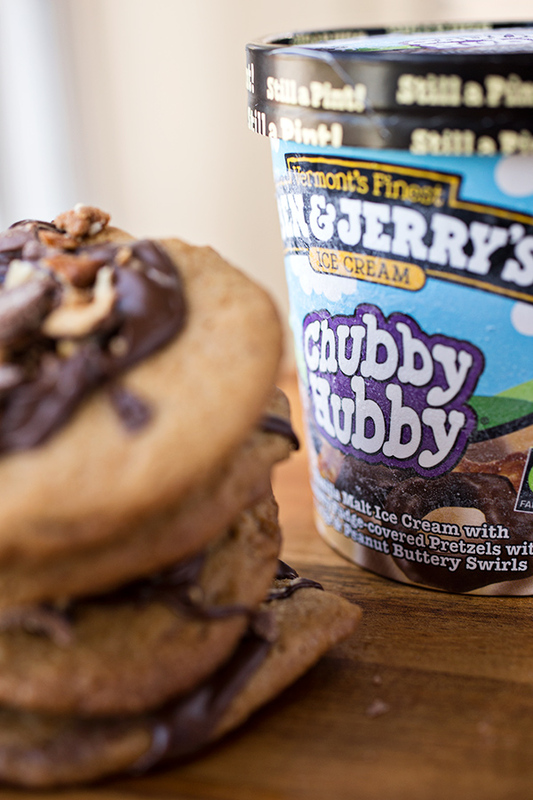 And by the way, aren’t guys notorious for loving their ice cream AND their cookies, equally? If my hubs was forced to choose one over the other, I don’t know that he could. So why not take inspiration from one of their favorites and put it into the other? Now we’re on to something! 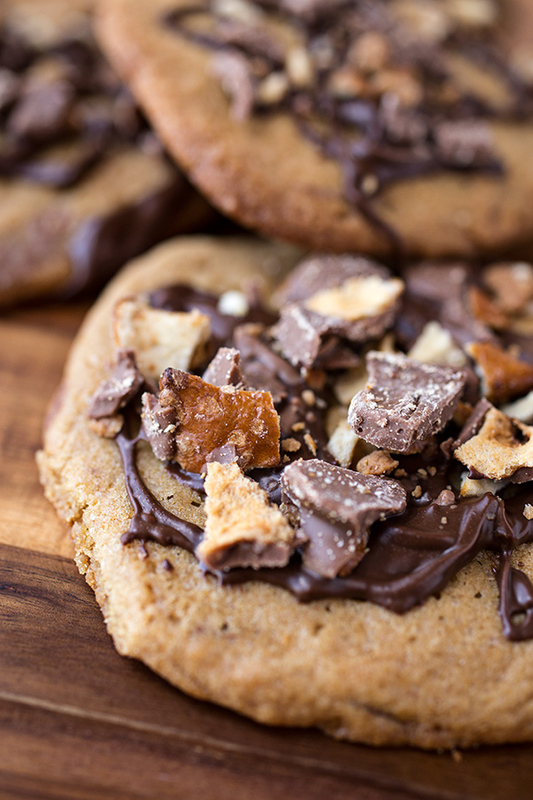 And so, though gals will undoubtedly fall head-over-heals for these chocolatey, chewy-centered, crispy-edged and decadent sweeties, “Chubby Hubby” Cookies are what I would totally call a “guy’s” cookie. 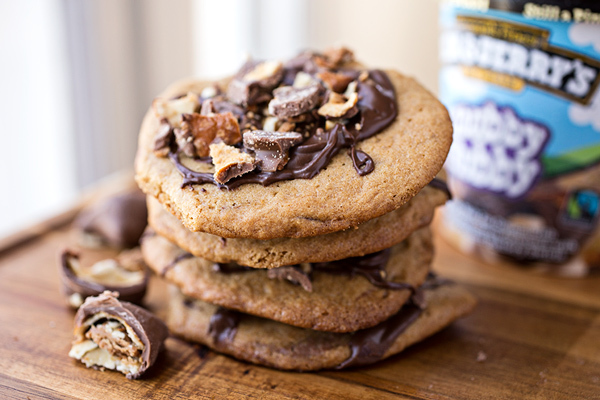 Vanilla-Malt cookie dough loaded with chunks of chopped, chocolate-covered and peanut butter-stuffed pretzels, and then covered with a chocolate-peanut butter drizzle and topped with more pretzel pieces—it’s the perfect combo of sweet with a little hint of salty. These babies are so fully-loaded that they almost bend under their own weight when held up— and if that’s not a proper “manly” cookie, then I don’t know what is. -Preheat the oven to 350°, and line a couple of baking sheets with parchment of silicone baking mats. -In a small/medium bowl, whisk together the flour, baking soda and pinch of salt to aerate and combine; set aside these dry ingredients for a moment. -Add in the eggs, allowing each to fully incorporate before adding the next one; then, add in the vanilla. 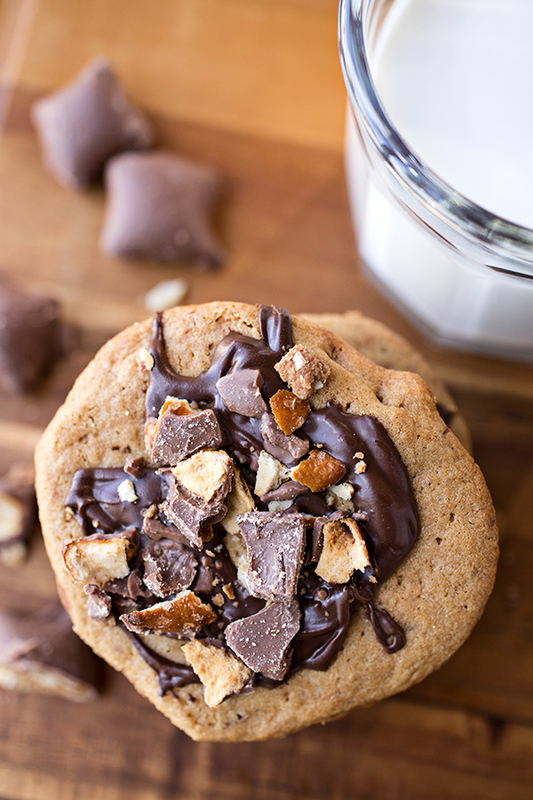 -Next, sprinkle in the malted milk and allow that to fully incorporate. 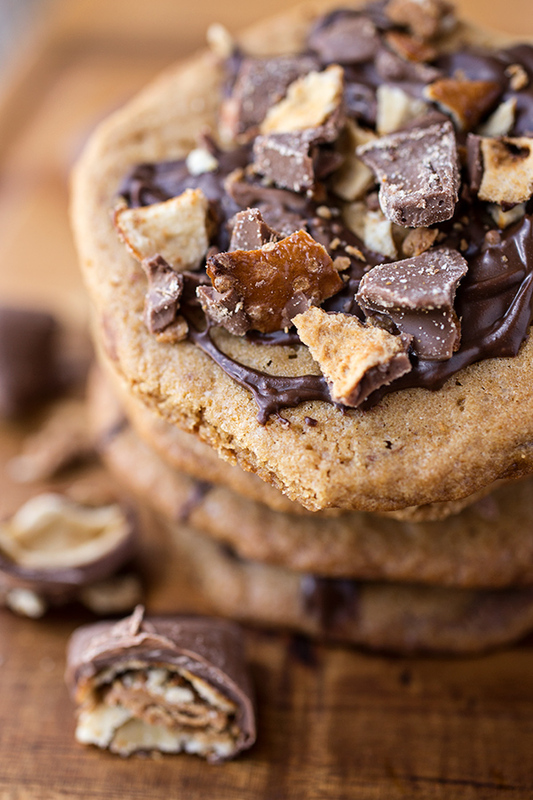 -Slowly add the dry ingredients into the batter, and once fully incorporated, sprinkle in 1 ½ cups of the chopped chocolate-peanut butter pretzel pieces, and briefly allow those to incorporate. -Chill the dough for about 30 minutes. -Scoop about a heaping tablespoon-size portion of the dough and place onto your prepared baking sheet(s); bake for about 12-14 minutes, or until golden and baked; allow to cool completely. 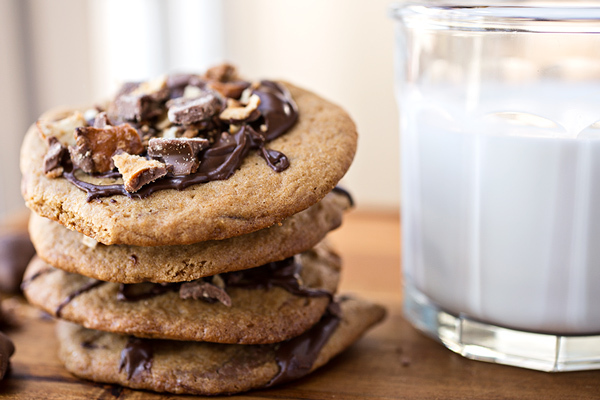 -Prepare the drizzle by melting the chocolate chips and the peanut butter chips in a bowl set over boiling water; once melted, gently swirl the two together using a fork, and drizzle over the fully cooled cookies; sprinkle some of the remaining ½ cup of chopped pretzel pieces over the drizzle, and allow to cool and set up before serving. Wow! I am all for anything malted. These are definitely on my to-do list! 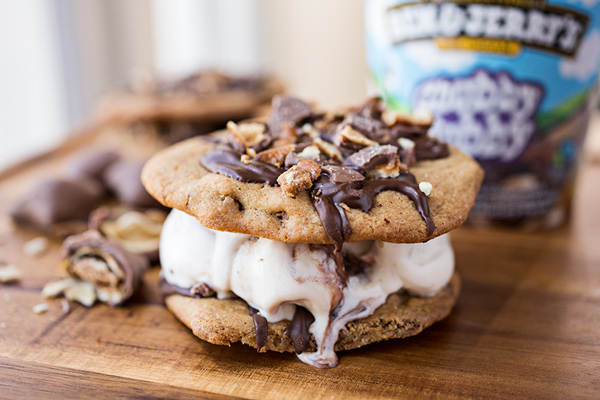 great idea with the ice cream sandwich. they look great! 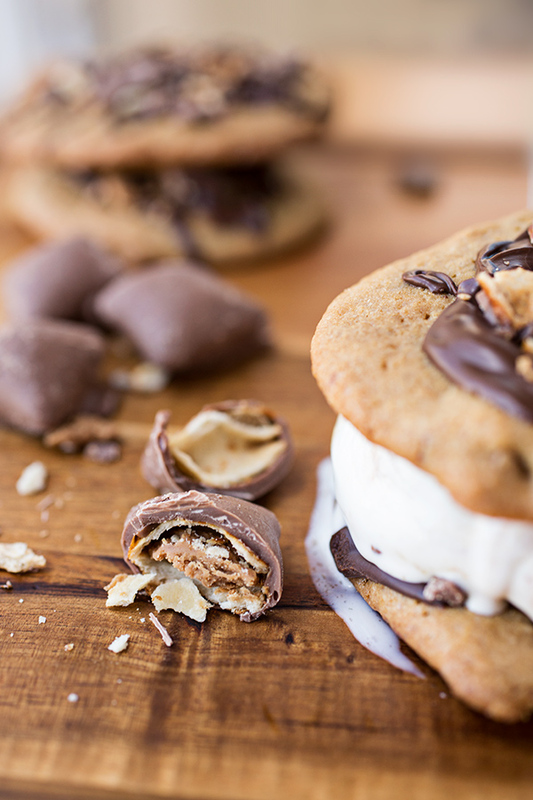 Loving these cookies and turning them into ice cream sandwiches is such a great idea. Looks and sounds wonderful! Hi Crystal, there’s just something about malt, isn’t there? Kinda “nutty”, and nice & rich! 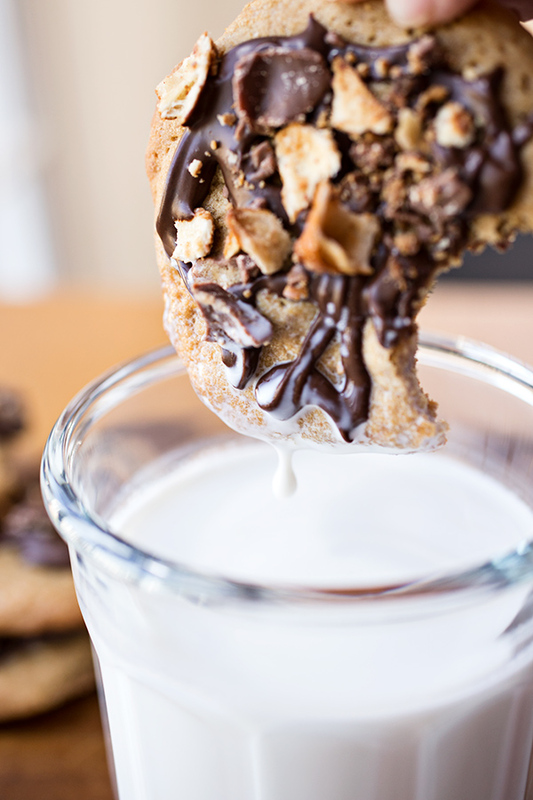 You have awakened my sweet tooth!